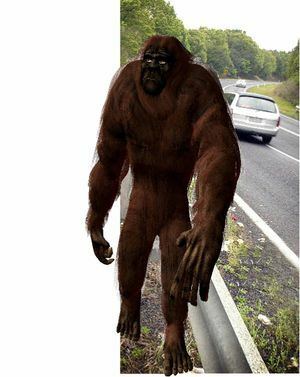 CALL it what you will: A Yeren, a Yeti or a Yowie, but the fact remains that people the world over keep seeing these big hairy buggers lurking in the night. The latest sighting took place recently just north of Bexhill when a Lismore resident and music videographer spied the classic creature crossing a moonlit Bangalow Road. The witness, who has asked not to be named for fear of reprisal, said he was driving back home from a night of filming at Eltham and had just turned onto the Bangalow Road heading for Lismore when he spied a creature jumping a barbed wire paddock fence before briefly pausing at the edge of the road. Suddenly the beast moved across the two lanes of bitumen, raising his arm to apparently shield its eyes from the bright high beam glare of the approaching car. "I would have seen it for between 20 and 30 seconds," the witness recalled. "It was really moving at the time. It leapt the fence no problem. "All I can remember was seeing this large black object with a solid build, lanky legs and long lanky arms. "It was like its head was shrunken into its shoulders," he said.